People are often confused between sales and marketing, and are not clear exactly what they are and how they are linked. We’ll cover an introduction to sales and marketing. By the end you will have an understanding of how sales are linked to marketing, and the importance of numbers. As we discussed in a previous post, you now have a new job as a salesperson – which is likely to be something that you haven’t done before. 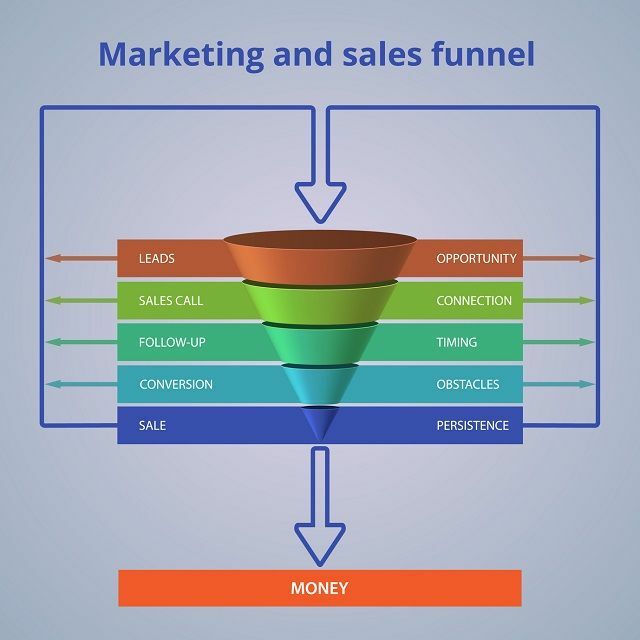 When we are looking at sales you will often hear of something that is called the sales funnel, which you can see above. We can see that enquiries filter down through the funnel until they become paying clients at the end. It also shows how you should be realistic about your level of initial enquiries, as you still have quite a way to go from enquiry until they actually become clients. Enquiry levels are straightforward; the more activity you do results in a higher number of enquiries, that go into the top of the funnel. This is good, but the wrong type of enquiries can be a waste if they don’t convert into sales. You may also hear about people saying they have x number of followers or views online – but if these are not likely to turn into actual clients then it is just a vanity number. This is where your business plan and marketing plan come together – you will be targeting the types of people that will become your ideal clients, so should be generating quality enquiries rather than just numbers. Once you have the enquiry, the source of the enquiry will influence the conversion ratio. If someone knows you, or has been referred by an existing client, then the chance of converting them into a client is much higher. Contrast that to someone who has only recently found your details online, and has just made contact without knowing about you before. This is where business video, combined with blogging, can help. The more opportunities people have for finding out more information before making the enquiry will result in a higher conversion rate overall. When we are looking at enquiries, you should be prepared that you won’t convert everyone – don’t become disheartened because you didn’t make a sale. It’s a normal part of the sales process. Even if you had an 80% conversion rate, that would mean you would still lose 2 out of every 10 enquiries. If you understand that you need to get through the no’s in order to reach the yes’s that helps with the process. You also need to understand that your conversion ratio will be lower when you first start out in business, as you will be building up experience and connections. This rate will increase over time, but it is something to be aware of. It is normal to have the occasional enquiry who just takes information and then does not proceed to become a client. If you structure your offering so that any disruption from them is minimised, it will benefit you. You may find meetings cancelled at the last minute or even no-shows. I remember once driving over 50 miles for a confirmed meeting with a potential new client that required urgent assistance, only to find that they never showed and then had stopped answering calls. This is normal though, so when things like this happen don’t worry – remember each no gets you closer to a yes when it is a numbers game. When you first start in business you may be so grateful to get a client that you take on ones that don’t fit your ideal profile, or you do work that isn’t exactly what you had planned to. It can be hard to turn this away, but if you are very clear about what you want to do and who you want to help then this is something that you should do. Otherwise you can find that you end up doing less profitable work that you don’t enjoy, and perhaps working with clients that are not an ideal fit. Finally, we will cover the actual sale itself. There are many books and courses that can help you with the processes, but one key point I would recommend is just being yourself. If you try and jump around like a high pressure salesperson (that you are not) that is likely to put people off. At the meeting you should listen to the client’s needs and offer solutions that may be suitable for them. You may come across the occasional person who wants things cheaply and will not value your time, so beware of this. You can always offer a discount in situations where it is warranted but if someone is looking to get things done too cheaply it should be a warning sign. Usually you find that not only are they asking for a low price but they then demand more of your time than a standard client would. We have covered the sales process and how it connects to marketing – you now know how clients flow through from marketing and a successful sales process to become clients; and the importance of numbers.